So I know that RNA polymerase catalyzes the phosphodiester bonds that hold the sugar backbones of a growing mRNA molecule together during transcription. However, I'm less sure about the hydrogen bonds between the nitrogenous bases of the forming RNA and the template DNA strands. Is RNA polymerase responsible for creating the hydrogen bonds between DNA and RNA? Is it, then -- I assume -- also responsible for breaking these bonds? Are the breaking bonds driven by chemical reactions or more due to the physical movement of the polymerase along the DNA template? This site mentions the transient H-bonds formed by holoenzyme at promoter sites, but I haven't been ale to fnd a reputable source discussing the transient H-bonds between nucleic acid strands. I'd appreciate if someone can provide a clearer molecular description of what's going on here. Pictures/animations are a plus! I wouldn't really say RNA polymerase is "creating" the hydrogen bonds so much as it's thermodynamics that creates them. When we talk about an enzyme "creating" a bond, what we're generally referring to is an enzyme facilitating a reaction by lowering its activation energy so that it can proceed. However, in the hydrogen bonding between base pairs, there's not really much activation energy to overcome. Before the formation, the nucleotide is just floating around in the cell (solvated by water), and forming a base pair is more energetically stable than not being paired. When a ribonucleotide happens to diffuse into contact with the unpaired DNA strand, the hydrogen bond will spontaneously form because it's energetically favorable. The thing about hydrogen bonds, though, is they're fairly weak, so there's an equilibrium between formation and breaking. When a mismatched nucleotide diffuses into that space, the hydrogen bonding isn't as strong, and it might be in an improper orientation, so it'll diffuse out again. When the correct nucleotide enters, the hydrogen bonds will form spontaneously, hold it there longer, and orientate it properly. This properly places the phosphates for backbone formation, which allows RNA polymerase to proceed with making the backbone. As for the breaking of the hydrogen bonds, it's the energy released from the phosphodiester bond formation that causes the bonds to break at the other end of the RNA-DNA hybrid. To simplify things a lot, it's kind of like a zipper, where forward translocation of RNA polymerase along the DNA strand is driven by phosphodiester bond formation, which breaks the hydrogen bonds of the RNA-DNA hybrid somewhat mechanically, as the nascent RNA strand leaves through a different channel than the DNA does. Although the answer provided by @StephenB is essentially correct, I’d like to supplement this with more visual illustrations — including a link to an animation which the poster requested — as well as reiterating the important points he makes about enzymes. This is a question about enzymology and structural biology and is essentially chemical in nature. No. Enzymes are not responsible for creating any sort of bond. 1. Reactions only occur which result in a decrease in Gibbs free energy. We are always comparing two alternative situations. In the case of nucleic acid hybridization, for example, we may at different stages of transcription have to consider ssDNA v. dsDNA, ssDNA and ssRNA v. RNA-DNA heteroduplex, DNA-DNA homoduplex v. RNA-DNA heteroduplex. The problem with transcription is not why rNTPs bind to DNA, but why different hydrogen-bonded structures, of necessity, occur at different stages in the cycle. 2. Reactions involve an equilibrium between the forward and reverse direction. Unless a reaction product is removed, there is generally no conceptual difficulty about the reaction also occurring in the reverse direction. The extent to which this happens will depend on the position of the equilibrium. For transcription such reversal is important because stretches of RNA, initially hydrogen-bonded to DNA, need to be released from it, and stretches of DNA have to alternate between being double-stranded and single-stranded. 3. Enzymes speed up reactions (in both forward and reverse direction). They have no effect on whether or not a reaction is thermodynamically favourable. As @StephenB mentioned, enzymes speed up reactions by affecting the activation energy — generally raising the ground state or lowering the activation energy by facilitating an alternative reaction sequence. In the case of the binding of the an rNTP we know from chemistry that the strength of a hydrogen bond depends on its directionality. Hence many random collisions will be unproductive. 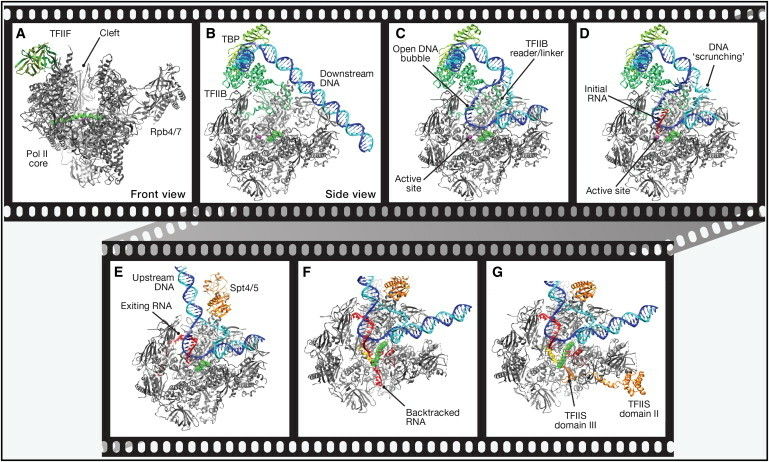 Without knowing anything about the real situation, we can speculate that weak bonds to residues on the rNTP binding-site of RNA polymerase may facilitate a reorientation to the optimal position for base pairing. This material is covered more fully in textbooks of biochemistry, e.g. Berg et al. Ch. 8. I have constructed my own composite of screen shots of that section of the movie (from about 3.00 min) that deals with binding of rNTPs. In contrast to the figure above, it shows only a small section of RNA polymerase in order to focus on the dynamic changes that occur in two sections of this protein on binding the substrate (another feature of many enzymes). …an NTP substrate first binds to an open active center conformation, adopting a preinsertion state…. The NTP then moves slightly to occupy the insertion site as the trigger loop folds to close the active center…. Closure of the active site around the NTP generates contacts that are required for correct NTP selection and leads to catalytic nucleotide incorporation and RNA extension …. In the ttEC/AMPcPP complex, AMPcPP forms a Watson–Crick base pair with the acceptor template sandwiched between the 39 end of the RNA/DNA hybrid on one side and the protein residues from the TH and BH on the other. Met b91238 (TH) and Thr b91088 (BH), which stack directly on the substrate and template bases, respectively, seem essential for the positioning and selection of the substrate (Fig. 2); the corresponding RNAPII residues Leu 1081 and Thr 831 seem to have similar functions in the yeast EC13. In agreement with modelling and biochemical studies1,4,15, Asn b9737 forms hydrogen bonds with both O39 and O29 of the substrate ribose, thereby permitting discrimination against the non-cognate dNTPs lacking either or both of these atoms (Fig. 2b, c). The interested reader will need to study the paper himself. I restrict myself to reminding him that the structures of enzymes are dynamic because there may be an equilibrium between different possible structures and the position of this equilibrium can be changed by the binding of other molecules to the enzyme. It’s still chemistry — not magic! Coda — Why no straight answer? The reader accustomed to having reaction mechanisms of enzymes presented in dogmatic form may wonder why there are so many ifs and buts and molecular dynamics involved in working out how the rNTP gets to the correct conformation to bind to the DNA template. The answer is that although the structure of the binding site (actually there appear to be two alternatives) is known in detail, the successive positions of the rNTP are not, because there is no way of ‘freezing’ it at these different stages. Generally one captures intermediates in a reaction by making derivatives of them that will bind but not react, for example. So it is relatively easy to get structures for the rNTP bound and hydrogen-bonded, but not on its way in. A 2017 paper in the Journal of Biophysics indicates that mathematical methods are still being used as the basis of arguments about the detailed binding mechanism. Not the answer you're looking for? Browse other questions tagged molecular-biology dna rna transcription polymerase or ask your own question.